MOWING grass under the shadow of Mount Taranaki can throw up plenty of rocks, logs and obstacles that would stress any mower and operator. For Barry Taunt of Taunt Contracting at Stratford, down time is less and productivity is up since he opted to put Pöttinger Novacat mower conditioners behind his tractors. With one of the mowers now in its third season Barry says he can't go past the Novacats for productivity and sheer strength. "We have two now, with the latest being a year old. I have not had to change a thing on the older mower, it has put in some very long hours, and over some rough country too. I have not even had to replace the cutter bar, and there would not be a lot of mowers where you could get away with that." Last season one of the Novacats went for forty hours straight, with no problems. "The only thing we changed was the driver," says Barry. He runs the extensive contracting business with his brother Glen, and parents Lyn and Les. With a quarry and cartage business there is more than enough work to keep the family busy through the season, ironing out the usual peaks in a contractor's year. Farmer feed back about the mowers' ability has been nothing but positive, and there has been a number of times the machines have worked alongside other brands, with superior results. "One farmer came and told me he could see quite clearly where our machines had been, the paddock was like a billiard table." He believes the fact the Novacats are pivoted in the middle makes for more even weight distribution, delivering a smoother cut and even condition across the swathe. Barry has also had the opportunity to compare the productivity of the mowers against competing brands, and found he can operate at at least 30% faster ground speed. "Most of the time we can operate comfortably at 12.5km per hour, with no blockages or clumping, while most others are going at 7-8 km per hour. This is despite some of the country around the mountain being rough in places and the worst damage the Novacats suffer is a shorn cutting blade. "The best thing there though is it is simply a case of unclipping the blade and getting another one on. There are no bolts to undo, it's spring action so down time is minimal and you are on your way again." Barry says the three point linkage hook up has significant advantages over the trailing mowers that are often popular with contractors. 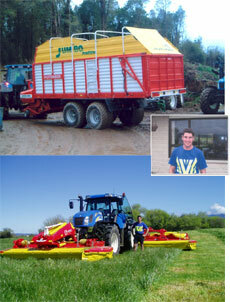 "It keeps the mower nice and close to the tractor for transport. You can lift it up and it folds in behind, which is good for narrower gateways and getting around on roads." He usually runs the mowers on a 140 horsepower 6900 John Deere. "It is not so much for the power, but for the stability the tractor provides, there is a decent amount of weight out there, and the bigger machine just sits nicely with it." This season Barry is looking forward to setting their latest Pöttinger machine up on their new JD 6920S. It is a new Alpha Motion front mounted mower-conditioner and when coupled up with a Novacat on the rear will provide a massive 6m cutting swathe. "This is a very cost effective way for us to really get the most from all our gear. Given the results we have had to date with Pottinger, this should work very well." GREATER productivity gains and exceptional build quality are the biggest benefits Michael Silson sees in his new Pöttinger Torro 5100 loader wagons. As owner of Riverlea Contracting in Kaponga, Taranaki, Michael’s business covers a radius of 100km and cartage can account for significant amount of time and money for him and his clients. Moving up to the Pöttinger loader wagons last season has meant Michael has been able to increase his capacity and productivity by almost 33 %. With our old wagons we were doing around 1.4 hectares an hour, with the Pöttingers we would be knocking out up to 2 hectares an hour, that is how much better they are in the paddock, and how much better their cubic capacity is.” A larger capacity has reduced the travelling between loading and unloading while billing clients has been simplified thanks to the Pöttingers’ in-cab monitor. “It is capable of telling us the number of loads we have done per day, and the time taken to pick up loads, and we can allow for longer or shortage cartage times in our charges without having to constantly watch the hour clock,” says Michael. Down time has been minimised with the user-friendly servicing features on the Torro wagons. This includes an easily accessed knife bank. “The bank swings to the side, making it easy to get it for the daily sharpen.” A simple spring loaded system means the blades themselves are also easy to put on and off. The blades themselves provide an excellent, precise cut that Michael says is the best he has seen on any wagon. The pendulum suspension pickup is a unique feature he believes adds to the machine’s ability to collect grass very effectively. Despite the Torro wagons’ size, Michael says he is impressed with the stability they have on steeper terrain. “They are also very good on softer ground. We used them over winter to collect grass from the Kapuni farm site, where it is simply too wet to use the self-propelled machine, and they performed very well! Manoeuvrability through narrow gates is exceptional, aided by a steering axle. “It is quite amazing what gate ways you can get them through! he says. Opting for the bigger wagons has meant tractor size has been lifted, from a New Holland TM 165 to a TM 175, providing plenty of torque for keeping the momentum going with the larger wagons on behind. Gary Graham runs two dairy units, milking 1050 cows at Atarau, in the Grey River Valley, West Coast of the South Island, New Zealand. Gary and his wife, Stacey are very busy people, as they also own and operate an Agricultural Contracting business, specialising in grass harvesting for quality silage production to feed the cows of the West Coast's progressive Dairy Industry. Gary runs 2 Pöttinger JUMBO 6000L loader wagons, and is considering a purchase of a third JUMBO to cope with the extra workload, mainly from Government owned "Landcorp" farms which have been extensively drained by excavator. The fields being reformed into "hump and hollow" type conours to assist drainage in difficult soil types and very high rainfall (up to 4.5-5 metres = 195 inches per year)! This high rainfall means a very small window of "fine" weather for harvesting, so Gary has also purchased a Pöttinger 8600 Novacat triple mower 'Collector' unit to speed up mowing operations, prior to pickup and transport with the Jumbo wagons. Gary says the loader wagon system is much more efficient and far superior to the alternative self propelled Forager and road trucks, which often get bogged down!! Gary's Jumbo's are paired with New Holland TM 195 (200hp) tractors equipped with wide tread tyres as are the Jumbo wagons on 700/45-22.5 tyres, which also make them easier to pull over the stack/pit when unloading. Gary says "The Jumbo wagons ability to give consistent chop length, high quality silage for his customers in extremely difficult (wet) harvesting conditions is very impressive." The two Jumbos harvested a total of approximately 5500-6000 hectares consistently over th last two seasons, which is a huge amount of crop, and Gary pays much praise to the back up from the service team from his local Pöttinger Dealer, Westland Farmers based in Westport, with a large service workshop also in Dobson/Greymouth area. 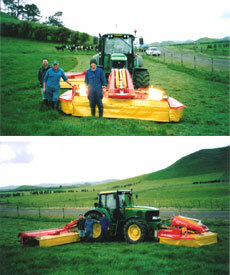 Gary's final comment: "Consistent chop length, gives excellent compaction and high quality silage to the customers." Silage innoculant is used an specified by most clients and silage quality tested out @ 12.2 ME, in a very wet season last year. On a 12 kilometre job (ie 24 kms turnaround) outperformed a self propelled forager and 4 transport trucks quite easily.